Research shows that eating citrus fruit which are high on flavonoids may lower women's stroke risk. According to research reported in Stroke: Journal of the American Heart Association, a category of flavonoids found in citrus fruits may reduce stroke risk. This prospective study is one of the first in which researchers examine how consuming flavonoid subclasses affects the risk of stroke. "Studies have shown higher fruit, vegetable and specifically vitamin C intake is associated with reduced stroke risk," said Aedín Cassidy, Ph.D., the study's lead author and professor of nutrition at Norwich Medical School in the University of East Anglia in Norwich, United Kingdom. "Flavonoids are thought to provide some of that protection through several mechanisms, including improved blood vessel function and an anti-inflammatory effect." Cassidy and colleagues used 14-years of follow-up data from the Nurse's Health Study, which included 69,622 women who reported their food intake, including details on fruit and vegetable consumption every four years. Researchers examined the relationship of the six main subclasses of flavonoids commonly consumed in the U.S. diet — flavanones, anthocyanins, flavan-3-ols, flavonoid polymers, flavonols and flavones — with risk of ischemic, hemorrhagic and total stroke. As expected, the researchers didn't find a beneficial association between total flavonoid consumption and stroke risk, as the biological activity of the sub-classes differ. However, they found that women who ate high amounts of flavanones in citrus had a 19 percent lower risk of blood clot-related (ischemic) stroke than women who consumed the least amounts. In the study, flavanones came primarily from oranges and orange juice (82 percent) and grapefruit and grapefruit juice (14 percent). However, researchers recommended that consumers increase their citrus fruit intake, rather than juice, due to the high sugar content of commercial fruit juices. 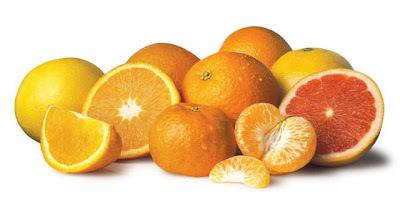 A previous study found that citrus fruit and juice intake, but not intake of other fruits, protected against risk of ischemic stroke and intracerebral hemorrhage. Another study found no association between yellow and orange fruits and stroke risk, but did link increased consumption of white fruits like apples and pears with lower stroke risk. An additional study found that Swedish women who ate the highest levels of antioxidants – about 50 percent from fruits and vegetables – had fewer strokes than those with lower antioxidant levels. More studies are needed to confirm the association between flavanone consumption and stroke risk, and to gain a better understanding about why the association occurs, the authors said.